Argon laser photocoagulation is a technique which is routinely used in clinical practise for a wide variety of retinal problems. Early studies largely done prior to and shortly after the introduction of laser photocoagulation examined the mechanisms of photocoagulation and the histological consequences for the retina at the coagulation site (1). These studies showed that the light energy was largely absorbed by the pigment epithelial cells and that damage to the overlying photoreceptors and the inner retina was predominantly due to thermal conduction from this area of absorption, and sometimes due to the mechanical shock wave effects especially when Q-switched laser was used. However, many of the effects of laser photocoagulation are not readily explained by the known changes in retinal structure at the coagulation site. For example, the dramatic effect of pan-retinal photocoagulation in reversing the invasion of the macula by newly formed blood vessels which occurs in diabetic retinopathy appears to be due to actions at a distance because the photocoagulation is done in the periphery (2). Similarly a grid photocoagulation pattern is as effective in containing sub-retinal vascular growth as coagulation aimed specifically at th egrowing vessels. 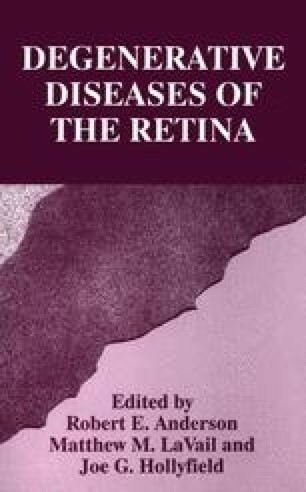 In certain animal models of the inherited retinal degeneration retinitis pigmentosa it had been noted that mechanical injury to the retina could paradoxically slow the photoreceptor loss (3).This prompted us to examine whether controlled photocoagulation could have similar effect and we found that there was indeed increased survival of photoreceptors on the flanks of the coagulation lesions.